It's show time! 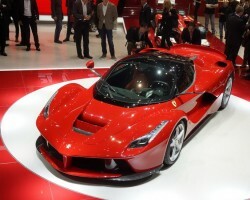 And there's no car show more important this year than that in Geneva. After years of fawning over prototypes we finally got up close and personal with the car that could resurrect Alfa Romeo. Sure the headlights look like something of an afterthought, but the 4C is a sleek, purposeful, mid-engined sports car, so what is not to love? 'Launch Editions' of the car will arrive first, bursting with options and a £55,000 price tag, but there are suggestions that the regular car will cost £47,000. This year is Aston Martin's centenary and the firm from Gaydon marked the occasion with the launch of the new Rapide S - a refreshed version of the existing car complete with a 570hp V12 engine. Also, while technically more of a Bertone creation rather than an Aston Martin, the Jet 2+2 (a shooting brake version of the Rapide) drew the crowds and showed what could be possible. The Audi tour de force started the night before Geneva at the Volkswagen Group event with the unveiling of the RS 6 Avant, a 560hp 4.0-litre über estate. This was followed up by the S3 Sportback, e-tron and g-tron versions of the A3 and the debut of the RS Q3 -the first SUV to wear the RS badge. Bentley describes the Flying Spur as 'the fastest and most powerful model' it has ever produced and with a 625hp twin-turbo W12 engine and top speed of 200mph who are we to argue? We did spot a hint of the EXP 9F concept around the rear end of the new saloon, but thankfully the SUV was not wheeled out for another appearance. Is BMW waiting for the Frankfurt Motor Show? Other than the 3 Series Gran Turismo (much better looking in the metal than in pictures) and the i3 Coupé Concept that was shown in Detroit the Bavarian stand seemed very quiet. The Corvette Stingray made its way from Detroit to Geneva, losing its roof along the way. To our eyes the convertible does not look as potent as the coupé; not that you could get near it as there was a pair of scantily clad women draped all over it for two days. Citroen called its MPV concept the Technospace, but in reality it is the next generation C4 Picasso. Alongside the Technospace was a facelifted version of the C3 supermini including a prototype that packed a Hybrid Air system promising emissions of just 69g/km with fuel economy of 97mpg. Having taken the somewhat unusual step of launching the Fiesta-based EcoSport at some consumer show in Spain the car's appearance at Geneva did not attract the attention that maybe it should have. Alongside the EcoSport was the new Mondeo, a car whose appearance was tempered by the news that it will be 2014 by the time we see it. Technically the Honda Civic Tourer is still a concept but the car seen in Geneva will be the one (bar some minor changes) that will go into production. There were even rumours of a Type R version to take on the Ford Focus ST estate. Honda also fitted its new 1.6-litre i-DTEC diesel under the bonnet of the CR-V and wheeled out the NSX concept again. The star of the Hyundai show was the i20 WRC, the Korean firm's upgraded World Rally competitor. Closer to the real world it also unveiled a facelift for the ix35 crossover including the latest developments of the fuel cell variant. The return of the Cherokee; no, not the Grand Cherokee, but the smaller model. Front end styling is somewhat questionable (looks like it is squinting to us), but it does look better in the metal than the pictures suggest. Geneva was meant to be the show where Kia joined the hot hatch world with the 203hp pro_cee'd GT, but instead much of the talk, both pre-show and during it, related to the Provo concept. Kia representatives were keen to point out that the hot coupé/crossover car was purely a concept and that the name would not make it to production, but the harm was done. Before the hypercar war broke out between Ferrari and McLaren the team from Sant'Agata tried to bloody both noses with the Veneno. Only three examples of the re-skinned Aventador will be produced, each costing £3 million, but when the LaFerrari and P1 were unveiled the Lamborghini looked silly in comparison. Having shown the new IS range to the world in Detroit Lexus brought the hybrid IS 300h version to Geneva along with the LF LC concept. It seems the P1 design study that was shown in Paris was so well received that McLaren decided to leave it alone - the production model shown in Geneva was virtually identical. Although, having seen Ron Dennis poking around the LaFerrari that - on paper at least - beats it in nearly every stat, we are pretty sure the tinkering is not finished. Has Mercedes-Benz jumped to the top of the hot hatch table? On figures alone the 360hp four-wheel drive A 45 AMG would certainly seem to have the measure of the competition. We will deliver our verdict once we have jumped behind the wheel. Before then we will tell you how the new CLA (the baby CLS) drives, as, after it leaves Geneva it will be straight into press launch duty. Mitsubishi has a self-imposed objective to ensure that 20 per cent of its cars will be EV-based by 2020 and to that end showed the Concept GR-HEV hybrid truck and the Concept CA-MiEV suburban electric car in Geneva. The GR-HEV uses a similar powertrain to that of the Outlander Plug-in Hybrid, delivering impressively low emissions and fuel consumption. The Concept CA on the other hand is a repackaged iMiEV in a more practical body. It was unusually quiet at the Nissan stand in Geneva with the Resonance concept, new Note and various Juke models (all of which we knew about ahead of time) lining up on its Geneva stand, along with the public debut of the 370Z Nismo of course. Like its PSA partner, Citroen, Peugeot showed off the new Hybrid Air system, but while noteworthy in itself it was overshadowed by the introduction of the 208 GTi - can this be the car to bring Pug back to the hot hatch table? Alongside the GTi was the facelifted RCZ, a hotter RCZ-R, the 2008 crossover and the Onyx supercar that was seen in Paris. Only in Geneva could the unveiling of a new 911 GT3 not rank as the top news story, but with the LaFerrari and P1 in attendance the 475hp Porker somewhat slipped into the shadows. The big news is that the most focused 911 is PDK only and now features four-wheel steer. Might we sense a duel with the forthcoming Nismo GT-R? Chinese manufacturer Qoros has big plans for Europe and has even hired former MINI stylist, Gert Hildebrand, to make its cars appeal to European buyers. Three models (a Skoda Octavia rivalling saloon and concepts of an estate and crossover) were on display and certainly served as signals of intent. Will UK buyers accept a Chinese brand into their arms? Only time will tell. Having culled much of its line-up in 2012 Renault reorganised and came to Geneva with more relevant models. The Juke rivalling Captur shows the way ahead while the Scenic XMOD (the next gen five-door Scenic) certainly looks the part. Rinspeed and Geneva go together like milk chocolate and crispy nougat, but the mad Swiss company's 2013 showing was remarkably normal compared to previous outings. The microMAX is essentially a private mini-bus that passengers stand rather than sit in. Power comes from a forklift drive system and it features a satnav and infotainment system developed by Harman. Rolls-Royce unveiled the Wraith simultaneously in Geneva and its Goodwood plant but the unanimous reaction seems to be that the two-tone paint scheme of launch cars does not suit the otherwise stunning 632hp coupé. Based on the Ghost saloon the Wraith has been tuned for a sportier drive and features the 1,340 LED lights in the headlining that was previously reserved for the Phantom. Following on from the regular five-door Leon hatchback, the SC (or Sports Coupé) is the latest model spun off the Volkswagen MQB platform. Rather than being just a Leon with two less doors the SC's wheelbase has been shortened to give it a racier look and, considering the inevitable Cupra version, a sportier drive too. The second model in the Octavia line-up took its bow in Geneva and despite only boasting 20 litres more boot space than the standard car the Combi estate is sure to be popular. Everyone remember the last Rodius? There is a new one on the way, but it's not quite so ugly. SsangYong also rolled out a further iteration of its stylish concept crossover. Any chance you could build it soon SsangYong? Suzuki has been quiet of late, save for variations of the Swift supermini, but with a new SX4 unveiled in Geneva that could be about to change. Described as a 'Qashqai killer', the SX4 draws on Suzuki's experience with four-wheel drive and is the first in a series of new Suzukis that will come on stream in the next 24 months. Officially it is a design study, but the Toyota FT-86 Open concept is the soft-top version of the GT86 that may appear in production form at Frankfurt. Will it be as good as its hard top brother? Toyota also drew attention to its stand with the iRoad - a three-wheeled personal mobility vehicle that leans into corners like a bike but without all that faffing around with leathers and crash helmets. What would a motor show be without a new Golf? How about a motor show with a quartet of new Golfs? Unveiled just after the Golf was announced as the European Car of the Year, the 220hp GTI vied for attention with the Golf Estate, the 184hp GTD model and the 85g/km BlueMotion Estate variant. All were overshadowed by the sublime 313mpg XL1 though, which, despite the looks, is a production car and not a concept. The Swedes took the somewhat unprecedented step of face-lifting six of its eight-car line-up in one go with the new S60, V60, XC60, S80, V70 and XC70 all debuting in Geneva. Along with the new looks Volvo also showed off its Sensus infotainment system that will soon be available across the range.